Now to Him who is able to do IMMEASURABLY MORE...: Flip a coin for LOVE! Flip a coin for LOVE! Doug and I are celebrating a special "Gotcha Day" today! But not the kind you might imagine. This is an "all because two people fell in love..." kind of Gotcha Day!!! Because this day, March 3rd, 32 years ago, began what would be a beautiful love story, the "once upon a time" moment that made every special moment since, possible! He was much older than I was. I was just a baby, according to his 19 year old self, because asking me out on a date would clearly have him accused by his peers of robbing the cradle.... Whatever! It's a good thing he decided I was cute before he found out how old I was! Rumor has it that he liked the way I picked up a baseball bat... Again, Whatever! I guess that comment won't make much sense to you, until I tell you that I was a "bat girl" for my high school baseball team. And though it sounds like I landed a role in the movie as Batman's girl, I can assure you that this particular role was far, far better!!! Being a "bat girl" meant that the entire varsity baseball team voted for ME to pick up their bats after they were slung into the dirt and the player was headed toward 1st base. Do you have any idea what an incredible privilege this was to my 16 year old, sophomore self??? Forget equal rights! You hit the ball and I'll pick up your bat... Because it also means that I get to travel on the bus to every single away game with the best looking junior and senior boys from my school, eat out with them on the way to the game, and then do it all again on the way back home. I was privy to their jokes and laughter and all the flirting I could handle! What a deal for a very single, "looking for love" kind of girl like me! Our high school baseball coach was considered one of the best in the state, and happened to be Doug's all-time favorite! He played for him every summer and had even begged his mom and dad to let him attend school where he coached. If they had agreed, I might have met Doug years earlier. But I would have only been in junior high, so never mind,.. I don't think that would have worked! By the time Doug laid eyes on me for the very first time, I was highly skilled in running from the dugout to pick up bats and then returning to my position right next to the fence to wait for the next one. And who should be standing on the other side of that fence that fateful night of March 3, 1981? Why... Doug McCary, of course!!! Being the friendly guy (and flirt) he was, he struck up conversation with me. I was flattered that an "older guy" such as he, would even want to talk to ME! His best friend, "Booby", was with him too! Hmmmm... 2 cute college boys in one night was almost more than I could stand!!! But then a victory against one of the best teams in the state was pulled off and I joined my jubilant team"mates", almost forgetting about the two hunks I'd just met at the fence. Word has it that Doug did NOT forget about me, however, and I became quite the conversation in his college classroom the next day. Doug was apparently deeply disappointed when he discovered that I was a mere 16 years old sophomore "child". What was he to do??? He was too embarrassed to admit that he was secretly dreaming of taking me out on a date, UNTIL Booby said that HE was going to ask me out! The competition between best friends for who could rob the cradle first began! Finally, a clear-headed friend stepped in with some age-old wisdom for the two of them. "Flip a coin!" he said, "The loser agrees to leave her alone!" So they did!!!! My entire future staked on the flip of a coin!! Are you kidding me? You would have walked away, Doug McCary??? Say it isn't so!!! Thankfully he didn't have to, because he WON the toss and in so doing, HE WON ME! In that single flip of a coin, my world would be changed forever! Doug and I would fall in love, get married, and begin a journey that would include countless moves across the US and a ministry that would take us to the ends of the earth together. God would bless us with 6 incredible treasures to parent and share our lives with.... We would walk through valley's so deep we thought we couldn't pull through and to mountain tops where we would celebrate life's greatest victories together. And the best part? 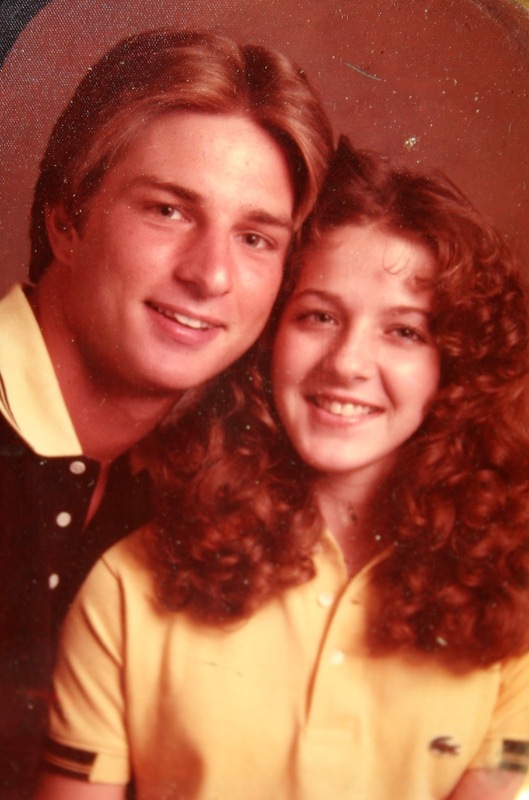 32 years later, we are more deeply in love than we have ever been! Flip a coin for LOVE? You bet!!! And I'm so glad he did!!! Thank you, Lord, that... "The lot is cast into the lap, But its every decision is from the Lord." Oh my word...I'm loving this. The story, the pictures, the hair..Ha Ha, and the continuing journey! Great post! LOVE this!!! My daughter is 3 years younger than her husband and I'll never forget her asking me, the summer after her father passed away no less, if she could go out with a 17 year old when she was 14!!! I am so very thankful for her precious husband, he may be older but he truly adores her:) Happy 32 years!!! !